To reduce costs and improve efficiency, operators have begun to exploit the Montney using multi-well pad developments. Pad development allows for a smaller surface footprint per well and minimal downtime between each well. Working with an operator on such a pad, Packers Plus completed 9 wells in 14 days, saving the operator an estimated $833,000 per well, or $7.5 million in total, in comparison to a typical plug-and-perf operation. An operator focused on the liquids-rich Kakwa field at depths of 4,000 m in west central Alberta encountered treating pressures that reached or exceeded the limitations of standard 69 MPa (10,000 psi) completion systems. Encouraged by the success and time savings of using the StackFRAC® HD ball-drop system in developing other assets, they looked to Packers Plus for a solution. The Packers Plus StackFRAC Titanium® XV system is capable of withstanding pressure of 103 MPa (15,000 psi) and extreme bottomhole temperatures. This is achieved by using innovative metallurgical composition and premium seal technology. Actuation balls enginnered to withstand high treating pressures are also used to ensure internal stage-to-stage isolation. 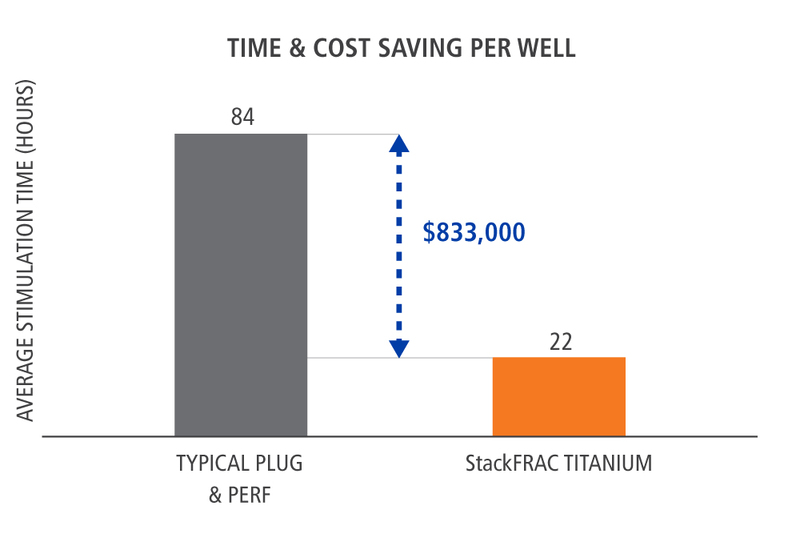 Using a continuous pumping operation to effectively stimulate isolated zones along the entire length of the wellbore, the Titanium XV system provides the same time and cost efficiencies as the StackFRAC HD system. These efficiencies become even more pronounced for multi-well pad development. StackFRAC Titanium XV systems were used to complete 9 wells of a 10-well pad, ranging from 13 to 22 stages. The tenth well was used as a microseismic monitor during the stimulation of the first 9 wells, and was later completed with a 21-stage Titanium XV system. An average of 60 tonnes of proppant were pumped in each of the 156 total stages with an average 290 m³ of gelled hydrocarbon. In total, nearly 9,500 tonnes of proppant and over 45,000 m³ of fluid were pumped. Using 24-hour operations, the entire stimulation operations were completed in 14 days with only 8 days of actual pumping time. The 6 additonal days included maintenance operations and moving stimulation equipment from one well to the next. 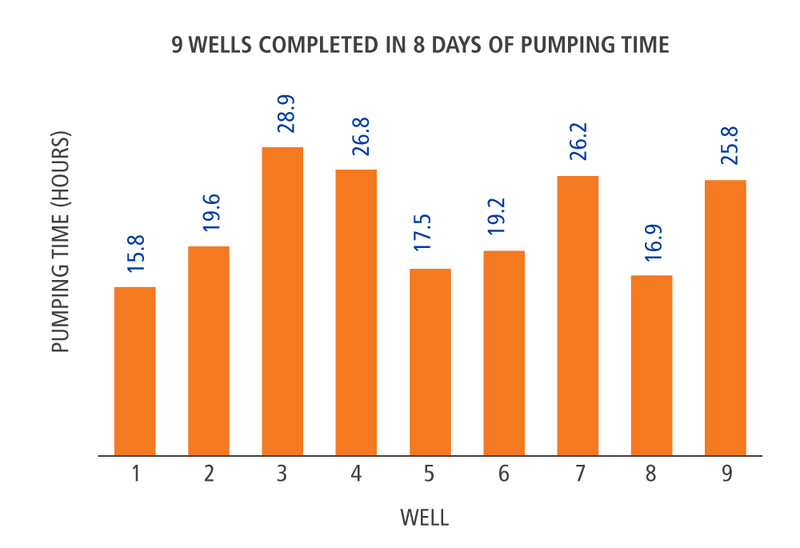 The savings in time-related costs saved the operator an estimated $7.5 million ($833,000 per well compared to a typical cemented plug-and-perf operation, based on 25-stage completions). The success of this project has prompted the operator to continue using StackFRAC Titanium XV systems for their multi-well pad development of the Montney and other target formations.